One of our patients has written a very kind thank you note, showing just how pleased he is with the results of his treatment. I couldn’t be happier with the results and the quality of the service. My teeth look great! I don’t seem to be able to keep a smile off my face now. I really appreciate that attention to detail was an essential part of the treatment. Big thank you! A regular patient of the practice felt his teeth had been ‘transformed’ after being treated by Dr Wong. He took the time to write a lovely thank you note to the practice. Thank you to Moira and the team. I am amazed by the transformation in my teeth. The 14 months of wearing a brace was well worth it. I would recommend doing it and definitely recommend Moira as the person to get to. Another patient of the practice expresses how her ‘confidence has grown’ after seeing the results of her treatment. I am very happy with the results; my confidence has massively grown. I approached Moira Wong Orthodontics because she came highly recommended by my dentist. Moira helped me throughout the whole treatment, starting at the initial consultation clearly explaining the step by step process. One thing I like about Moira is how she has a natural gift of making one feel relaxed, takes interest in your welfare and a true professional in her field. I never once dreaded my regular visits, if anything I looked forward to them. I would recommend Moira to people who like a five star service. Thank you Moira and all the friendly staff. Could not have asked for a better orthodontic team. 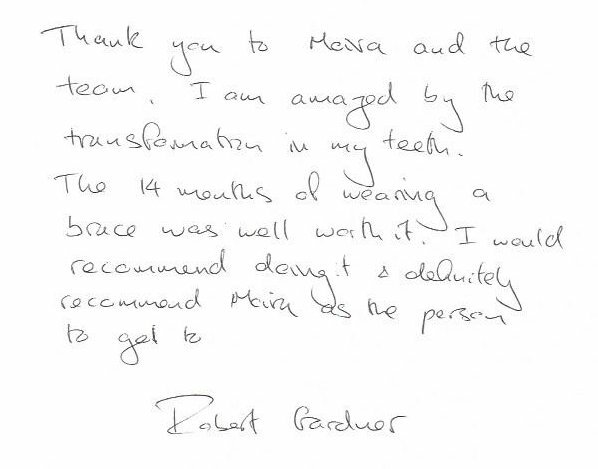 Going back to having braces as an adult can be VERY difficult, but Moira understood my needs and worked tirelessly to achieve a result that would please myself and the incredible high standard she sets for her work. My case involved having to go through orthognathic surgery and I can’t imagine anyone more competent than Moira and Piet to have dealt with that; they were by my side every step of the way and I can now say I have a perfectly functional bite. I recommend her to all the people who ask me who my ortho is, and even those who don’t. Thank you, Moira (and Lynda, and Sharon, and Tiana, and Jo, and Sheriee, and all the other smiley faces at 27A Kensington Church St)! Our reviews are also featured on Trustpilot, where you can leave your own review!